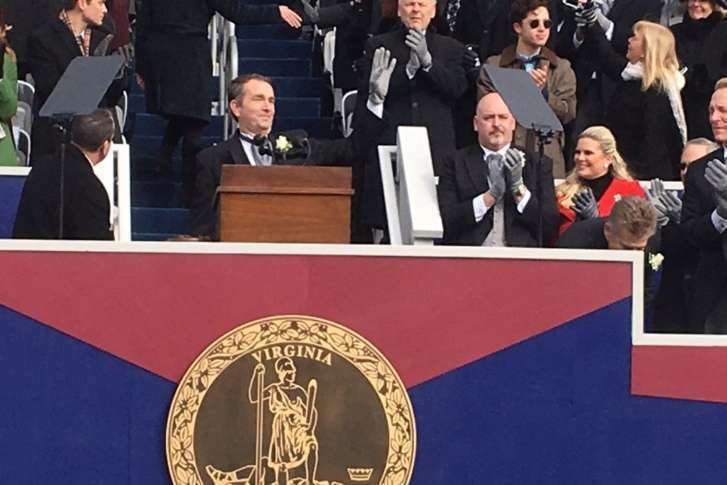 WASHINGTON — Below is the speech Governor Ralph Northam delivered at his inauguration on Saturday, Jan. 13. Mr. Speaker, Lt. Governor Fairfax, Attorney General Herring, Members of the General Assembly, Justices of the Supreme Court, Judge Tyler, honored guests, Pam, Aubrey, and Wes, my fellow Virginians. I am truly humbled that you have taken the time to be with us on such a special day for our Commonwealth. Today we carry out the peaceful transition of power. It dates to our earliest days as a country. And at this hour, more than 1.3 million Americans protect this right. They serve in our armed forces overseas and right here at home. They put their lives on the line to protect our way of life and we should always be grateful for their sacrifice. Because it was my duty. Because our Commonwealth was founded on public service. But the way ahead hasn’t always been smooth. But at the bottom of that same hill, one of the country’s largest slave-trading markets was coming to life. A place where Virginians would sell men, women, and children for profit. Our history is complex in Virginia. It includes good things, and bad. But no other place on earth can claim it. This unique heritage endows us with a responsibility to shape the future—to leave this place better than we found it. It’s a model that Governor Terry McAuliffe and his wife Dorothy have followed these past four years. Virginia is better off today because of them, and Pam and I are proud to have been their partners. Two hundred thousand new jobs. $20 billion in capital investment. Voting rights restored for 173,000 Virginians. 10 million more school breakfasts served to children who need them. First state in the nation to functionally end homelessness among veterans. That’s a record to be proud of, and I am ready to build upon it! The McAuliffe administration has been about putting the needs of the people you serve first. Those values defined my upbringing from the earliest days I can remember. She worked in health care, nursing sick people back to health on Virginia’s Eastern Shore. She volunteered with the hospice, comforting people in their final hours. She taught me that, no matter who we are or where we come from, we are all equal in the beginning — and in the end. My father, who grew up on a farm on the Eastern Shore, served in the Navy during World War II, a member of America’s greatest generation. He became a Commonwealth’s Attorney and a judge just as his father had before him. Before my brother joined the Navy and I joined the Army, my father always encouraged us to play sports. I think he knew we would learn the importance of teamwork and the fundamental truth that success isn’t about one person’s individual contributions, it’s about the team. Watching the things my parents did, for our family and for our community, taught me a lot growing up. But the greatest lesson I learned came from watching how they did those things. Their humble and steady service to the people around them taught me what strength looks like. It taught me that you don’t have to be loud to lead. I was blessed to grow up on Virginia’s Eastern Shore, and to call it my home. As a kid I spent hours behind our house, crabbing and fishing on the Chesapeake Bay. To this day that is where I find peace. When I was just old enough to take to the water myself, my dad helped me build a rowboat and launch it, with strict instructions: stay close to home. As I grew and became more comfortable, I began to take longer trips away from the shore, until I was ready to head out into the open water. I remember standing with my father as I prepared to embark, and like all good Dads, he knew I was nervous even before I did. He said, Ralph, remember—when you get out there, you can always trust your compass. If things get dark or foggy, if you can’t find your way—keep your eye on the compass. It’ll always bring you home safely. He was right about that compass. As I got older and took various jobs on the water, working on a deep sea fishing boat and as the captain of a ferry to Tangier Island, I came to trust that compass to guide me when the way ahead was not clear. Those words have stuck with me all these years because they’re so clear. They have become a kind of moral compass for me. They always call me back home safely. Virginia and this country need that more than ever these days. and when scoring political points gets in the way of dealing with real problems. We all have a moral compass deep in our hearts. And it’s time to summon it again, because we have a lot of work to do. We’re going in the wrong direction on healthcare in Virginia and America. More people need coverage, not less. It is past time for us to step forward together and expand Medicaid to nearly 400,000 Virginians who need access to care. We should also resolve together today to refrain from any effort to curtail a woman’s constitutional right to make her own decisions about her health. If we are going to build a healthier Virginia for everyone, we must address the public health crisis of gun violence. Gunshots kill more people in Virginia every year than car accidents, but if you walk into the right gun show, it’s easier to get a firearm than it is to rent a car. I am ready to work with you to make Virginia safer by passing smart reforms that keep guns away from people who shouldn’t have them. We have to acknowledge that the incredible economic progress we have made in Virginia has been uneven. As technology companies and sky scrapers rise in many regions, other parts of Virginia are watching blue collar jobs move out while the opioid crisis moves in. And those challenges are not limited to rural areas. In far too many places in Virginia, your zip code determines not just how well you will do, but how long you will live. Here in our capital city, a child born two miles that way can expect to live to about age 63. But a child born five miles in that direction can expect to live 20 years longer. You don’t have to be a doctor to know that something’s wrong. The solutions to these problems are not easy. But we do know what they are. The way ahead starts with access to quality health care and public education for every Virginian, no matter whom they are or where they live. It depends on smart interventions in the case of addiction or mental health challenges and a focused economic development strategy that connects the right people with the right skills and the right jobs. As Governor, I will approach these challenges with the same skills I learned as a doctor. Over the years I have taken care of thousands of children. Never once have they or their families asked me if I am a Democrat or a Republican, nor have I asked them. Each patient is a person in front of you, who’s sick. A child who needs your help, and who deserves every opportunity to thrive. Doctors are taught that we have a responsibility to do everything we can to make them better. A good doctor trusts science and brings no pre-conceived notions to the examining table. A good doctor listens first, to what a patient is saying and not saying. A good doctor understands that a symptom may have a hidden cause. The pain in a child’s belly could be an ulcer, for example. Or it could be from hunger because the pantry at home is bare and the last time she ate was lunch at school yesterday. We learn quickly that the problems patients are having are usually more complex than the symptoms we can see on the surface. And getting them back to health means devoting the time and resources it takes to alleviate those root causes. As Governor, I will draw on these lessons. I will remember that Virginians didn’t send us here to be Democrats or Republicans — they sent us here to solve problems. I will remember that no one has a monopoly on good ideas. The path to progress is marked by honest give and take among people who truly want to make life better for those around them. I will remember that treating symptoms of problems may be easy in the short-run, but getting to the root of the problem and solving it from the bottom up is always more effective in the long-run. When we make decisions, we’ll apply this test. • Does this action do the most good for the most Virginians? • Have we been transparent with the public about what we are doing and why we are doing it? • And finally, is there a better way forward that we haven’t yet considered? The guiding principle of this administration will be simple: we will work together to make our Commonwealth work better for all Virginians, no matter who they are or where they’re from. We cannot rest until every family and every community has the same access to opportunity that others do. Here are my personal commitments to you. • I will always tell the truth. • I will strive every day to maintain the trust you placed in me on Election Day. • I will always put Virginia’s interests first. • I will work with anyone whose policies help Virginia. And when they do not, I will oppose them. • I will visit every city and county while I’m Governor, and every public college and university. • I will continue to personally care for patients at RAM, Virginia’s Remote Area Medical clinic—and keep pushing to cover more and more Virginians. • I will be there personally to welcome Virginia National Guardsmen and women when they return home from overseas. • And my door will always be open to you. Here’s the last commitment I make to you. And it’s the most important. It comes from an experience that has shaped the way I practice medicine and public service. Shortly after I left the Army and began practicing as a child neurologist, I met a young couple whose son was living with severe autism. I examined the little boy, and his case was tough. So I explained to his mother that nothing I could do would alter her son’s condition or improve his quality of life. More than a decade later, a woman approached me in the grocery store. She reminded me that I had seen her son years ago, and that she and her family chose not to return for a follow-up. She asked me if I knew why they had not returned, and I confessed to her that I did not, and that I hadn’t really thought much about it. When I told her that I was unable to help her son, I diagnosed the problem correctly. From that moment on, I have recognized the incredible power of hope and my responsibility to preserve it in the people I serve. Hope is not just a source of comfort for the afflicted — it is a wellspring of energy to fight for a better tomorrow, no matter the odds. I am committed as your Governor to fight every day for the hope that tomorrow will be better — for all of us, not just some of us. If we work together, tomorrow can be better for the nearly 400,000 Virginians who are one illness or accident away from bankruptcy because they have no insurance. Tomorrow can be better for the families in rural communities who are praying for new jobs so their children don’t have to move away to build happy lives. Tomorrow can be better for the children who are sitting in crowded and crumbling schools across this state, tired and distracted from too little food and too much violence in their communities. Tomorrow can be better for the men and women who depend on clean air and water for their livelihood and for the children who will inherit the environment we pass on to them. Tomorrow can be better for people who too often face discrimination, harassment or violence because of their race, gender, religion, or sexual orientation. If we work together today, tomorrow will be better for all of the Virginians who have placed their trust in us to fight for them every day. This country is once again looking to Virginia to lead the way. Let us lead with humility and optimism, telling the truth, learning from history and removing every obstacle to progress for all Virginians. Let us rely on the compass we all carry to show us the way ahead.